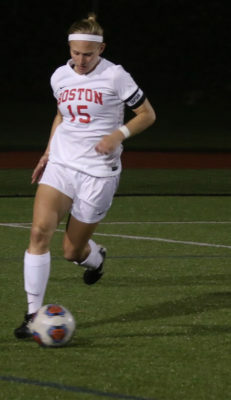 Marred by a five-match winless streak going into its Saturday afternoon tilt with American University, the Boston University women’s soccer team felt the pressure, even if it is only mid-September. Instead of cracking under the pressure, the Terriers (2-5-2, 1-0 Patriot League) embraced it, and with a final scoreline of 6-0, ran the Eagles (1-8, 0-2 Patriot League) off of Nickerson Field. Five different Terriers contributed to the scoring onslaught, including a brace from senior forward Christina Wakefield and a first career goal for senior captain Jacki Carty, in BU’s highest scoring output since its 6-1 triumph over Lafayette College on Oct. 11, 2014. In its previous four matchups, BU was outscored 5-1 and if one looks at its scoring numbers since game one at the University of Louisville, it’s posted just two multi-score games while being outscored 13-6. Against American, however, the Terriers got off to a dream start, courtesy of graduate student Rachel Bloznalis. Just over seven minutes into the game, the Upton native sent a beautiful over-the-top pass to junior forward McKenna Doyle, whose perfect lob over goalkeeper Amy Krotine gave BU the early 1-0 lead on her first goal of the season. Just two minutes later, another BU goal, this time from a rookie, Anna Heilferty. Junior midfielder Julianna Chen threaded the ball down the left sideline to Heilferty, who for a freshman, showed expert class in dribbling around a charging Krotine and finishing with her left foot to up the Terriers advantage to 2-0. Thirteen minutes elapsed between goals and yet again, it was the home side that dictated play. In the 22nd and 28th minutes respectively, both Wakefield and sophomore midfielder Chloee Sagmoe were found in front of the American goal, as they each poked their efforts past Krotine to increase their lead to 4-0. And although the BU defense should be acknowledged for not letting the Eagles register a single shot or corner kick in the first half, Saturday was all about goals, and none were better than its penultimate one. With three minutes to go in the half, sophomore defender Shannon Keefe sent a cross into the American penalty box, where Carty leaped up above everyone else to head it by Krotine. The goal gave the Terriers the 5-0 lead at halftime and for Carty, whose career has been disrupted through injuries and “personal challenges” as Feldman said, her first varsity goal. Although the second half was much more ordinary in that only one goal was scored, it was nevertheless scored by BU. Just over six minutes into the second half, the Terriers had a free-kick, and instantaneously sent it into junior defender Pietra Sweeney. The Acton native acted quickly in crossing it far post to Wakefield, who capped off the afternoon with her second goal to send BU to the blowout victory. Every conference game can affect playoff chances and seedings, and with the way the Terriers started conference play, Feldman said she couldn’t be anything but proud of her team’s effort. Despite the blowout, Feldman still said she believes that these upcoming games will not be a cakewalk.